Are you preparing to take the Cardiopulmonary Anatomy and Physiology Final Exam in Respiratory Therapy school? If so, good, because this is the post is for you. That’s because, below, you can get access to our study guide that lists out a variety of practice questions covering a wide range of topics all about Cardio A&P. Now, of course, each and every Respiratory Therapy program is different, but still, this study guide will serve as a fantastic review for much of the information that you learned throughout the semester concerning most of the topics within your Cardio A&P course. So if you’re ready, let’s go ahead and dive right in! 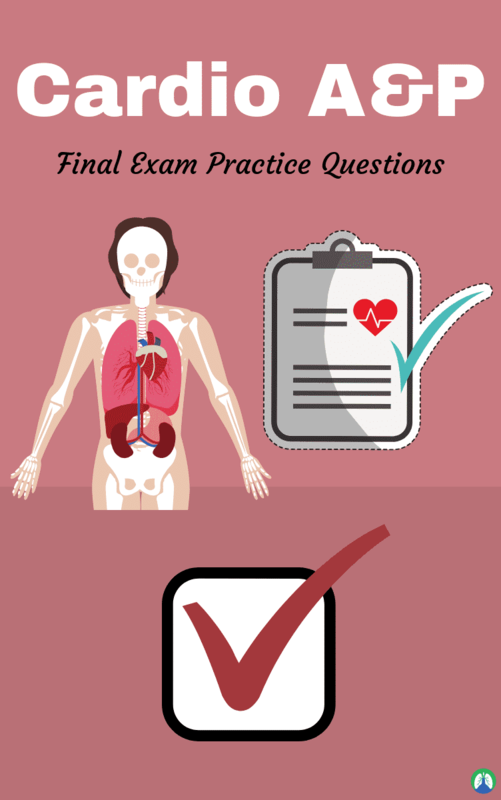 Below you can find all of the practice questions that can help you prepare for your Cardio A&P Final Exam. If you want the correct answers as well, you can get them (free) by Clicking Here. 1. As the respiratory therapist, you have given supplemental oxygen to a patient with pneumonia. What would cause the patient to be hypoxemic? 2. When auscultating over an area of pneumonia, what breath sound can be expected? 6. The respiratory therapist is reviewing the record of a patient for whom an arterial blood gas test has been ordered. In order to properly prepare for the arterial puncture, which of the following lab values is most critical to review? A. a decreased sodium level. C. an elevated potassium level. 11. Which type of epithelial tissue is found lining the heart, blood vessels, and lymphatic vessels? 12. Which of the following types of tissues is responsible for pumping blood throughout the body? 13. Which of the following is NOT one of the main tissue types found in the human body? 14. Which of the following is not one of the three main factors influencing blood pressure? 15. Which statement best describes arteries? A. All carry oxygenated blood to the heart. B. All carry blood away from the heart. C. All contain valves to prevent the backflow of blood. D. Only large arteries are lined with endothelium. 16. Permitting the exchange of nutrients and gases between the blood and tissue cells is the primary function of _______. 17. The pulse pressure is ________. 18. Blood flow to the skin ________. 19. Which of the choices below does not involve tissue perfusion? 20. The arteries that directly feed into the capillary beds are called ________. 21. Select the correct statement about factors that influence blood pressure. A. An increase in cardiac output corresponds to a decrease in blood pressure, due to the increased delivery. B. Systemic vasodilation would increase blood pressure, due to diversion of blood to essential areas. C. Excess protein production would decrease blood pressure. 22. Where in the body would you find low oxygen levels causing vasoconstriction and high levels causing vasodilation? 23. Which of the following blood pressure readings would be indicative of hypertension? 31. Electrical signals called _____ travel along the plasma membrane of a neuron and stimulate the release of chemicals called _____ that are then used to communicate with other cells. 32. Which of the following describes the effect of end-diastolic volume on stroke volume? A. A decrease in end-diastolic volume creates a vacuum drawing more blood into the ventricle increasing stroke volume. B. An increase in end-diastolic volume stretches ventricular muscle cells to lengths greater than optimum, decreasing stroke volume. C. A decrease in end-diastolic volume allows cardiac muscle to relax, conserving energy for the next contraction, thereby increasing stroke volume of that next contraction. D. An increase in end-diastolic volume stretches ventricular muscle cells to lengths closer to optimum, increasing the strength of contraction and thereby increasing stroke volume. 33. The period of ventricular contraction is called ___________, whereas the period of ventricular relaxation is called_________. 34. Which of the following components of an ECG represent ventricular repolarization? 35. Which of the following factors determines preload? 37. Cardiac output is determined by what two variable? A. ventricle is greater than the pressure within the aorta. B. ventricle is less than the pressure within the aorta. C. ventricle is greater than the pressure within the pulmonary artery. D. ventricle is less than the pressure within the pulmonary artery. 39. What two major regions of the heart contain a concentration of pacemaker cells? 41. Which of the following is the correct conduction pathway through the heart? 42. In what phase is the cardiac cycle when AV valves are open and semilunar valves are closed? 44. During which phase of the cardiac cycle are all four heart valves open? A. rapidly change central venous pressure with small changes in blood volume. C. provide the driving force for the movement of blood through the vasculature during diastole. D. accommodate large volumes of blood with little change in pressure. 46. An increase in heart rate can be mediated through which of the following? 49. Poiseuilles’s Law states that at a constant driving pressure, the flow rate of liquid through a capillary tube is directly proportional to the ____ power of the radius of the tube and inversely proportional to the length and viscosity of the tube. 50. Which of the following does not apply to arterioles? 51. Acetylcholine causes _____ of bronchioles via _____ receptors. 54. Albuterol, an asthma medication, dilates bronchioles by mimicking the effects of epinephrine on _____ receptors in smooth muscle. 56. When inflated, alveoli have relatively______, which aids in expiration. 58. What happens to the oxygen-hemoglobin dissociation curve as blood passes through tissues with a very low metabolic rate? 59. The dorsal respiratory group (DRG) located in the _____ functions to _____. 61. In a typical capillary bed (in most tissues), reabsorption occurs at the _____ end and ultrafiltration occurs at the _____ end. 62. Which is true about capillary exchange in Bowman’s capsule? 66. What type of agent blocks the Na+/Cl- transporter in the nephron? 68. Which is a major cause of arrhythmias? 70. Tachycardia can result from activation of which receptor? 72. Arteries carry blood ____ the heart and _____ the tissues. 73. Veins carry blood ____ the heart and _____ the tissues. 75. Bronchodilation is mediation by _____ receptors in the lung and _____. So there you have it. I hope this study guide was helpful for you and can serve as a great review for your Cardio A&P Final Exam. As I mentioned before, I realize that each Respiratory Therapy program is different, so I may not have included a question about every single topic that you’ll see on your final exam. Still, if you go through this information, I have no doubt that you can boost your knowledge and improve your final grade when it’s all said and done. Thank you for reading and I wish you the best of luck and as always, breathe easy my friend.